Mark Cuban (born July 31, 1958) is an American businessman, investor, movie producer, author, television personality and philanthropist. He is the owner of the NBA's Dallas Mavericks, Landmark Theatres, and Magnolia Pictures, and the chairman of the HDTV cable network AXS TV. 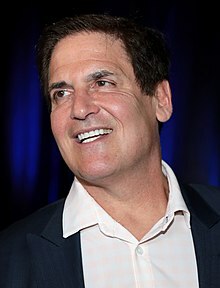 As of September 2015, Cuban has publicly expressed interest in running for president in the 2016 U.S. presidential election, citing that he "could beat both Trump and Clinton". He later decided not to run. On October 9, 2015, Cuban announced his intentions to run for Speaker of the House to replace John Boehner. ↑ "NBA biography". Nba.com. January 14, 2000. Retrieved June 29, 2012. ↑ Javers, Eamon (September 14, 2015) "Mark Cuban: I could beat Trump AND Clinton", MSNBC. ↑ Jackson, David (September 14, 2015) "Now Mark Cuban is thinking of running for president", USA Today. ↑ Severa, Kenny (September 14, 2015) "2016 Presidential Election: Mark Cuban Says He Can Beat Donald Trump, Hillary Clinton", Latin Post. ↑ "Mark Cuban running for speaker? It's possible". CNBC.com. Retrieved October 11, 2015. ↑ "Mark Cuban: Maybe I'll run for Speaker". INC.com. Retrieved October 11, 2015. This page was last changed on 24 March 2019, at 06:16.